It just seemed so wrong. It was time for spinning class, I was at the gym, but I was carrying a box full of cupcakes. This was an oxymoron in action, and I wasn’t sure the greeters at the front counter would let me enter the facility toting that quantity of simple carbs. I had to do it though because it was my instructor’s birthday. I’ve been attending his spinning classes for almost three years, and he always reminds the class when his birthday is drawing near. And, well, I’ll use any excuse to bake. 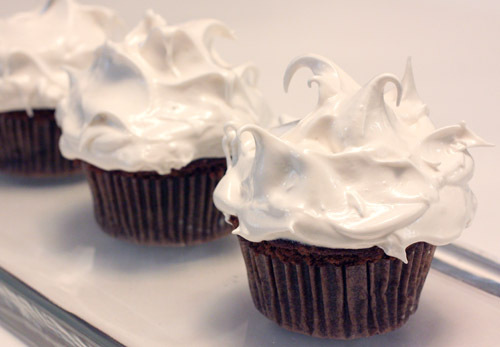 These fluffy treats are from Cupcakes by Elinor Klivans which is a delightful, little book. I’ve made her cinnamon sugar puff cupcakes which are like doughnut muffins and her caramel-covered tea cakes, and both were fantastic. The book includes cupcakes with all sorts of different toppings and fillings for all sorts of occasions. 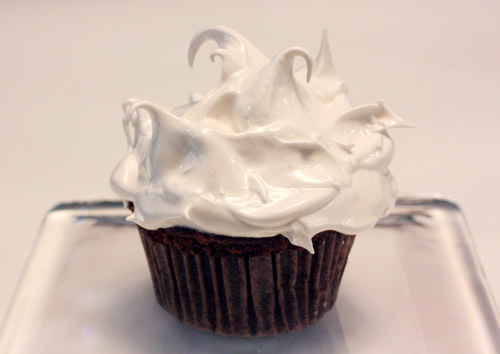 The white mountain chocolate cupcake is made with chocolate sour cream cupcake batter and seven-minute frosting. The batter is made rich and delicious with the addition of sour cream, but the important thing here is the frosting. If you have never made a seven-minute frosting, or if it has been awhile as it had been for me, go now to start separating some egg whites. I don’t know how I let so much time pass since I’d last made this kind of frosting, but it is a simply wonderful thing. Egg whites are beaten in a bowl with water, sugar, and cream of tartar. The bowl is set over a pot of barely simmering water, and you continue to beat for seven minutes. 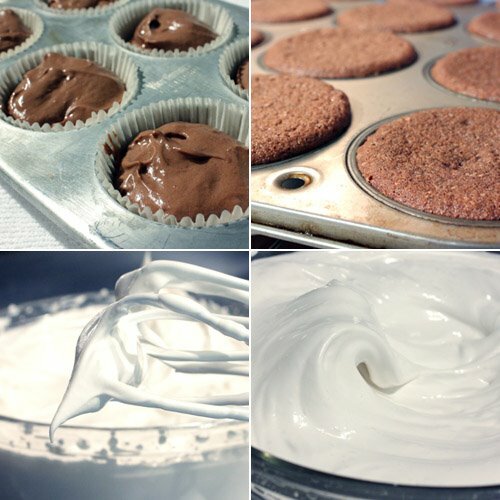 A glossy, thick, luscious frosting develops before your eyes. After seven minutes, the bowl is removed from the pan of simmering water, vanilla is added, and you mix for another couple of minutes. What you get is the best possible incarnation of marshmallow fluff. Next, you get to apply this fluffery to the cupcakes, and that is almost as much fun as eating it. You swoop and swirl and let the frosting take whatever crazy shape it can. Because of the lightness of the frosting, this is one that is best applied liberally. My spinning instructor was surprised and delighted by the cupcakes, and he offered to share with everyone—after class of course. Luckily, everyone felt like they deserved a cupcake or two after that class. I was invited by the Texas Beef Council to participate in their Beef Recipe Grilling Experience, and I thought why not, sure. I knew Kurt would be happy with a grilled steak for a meal. 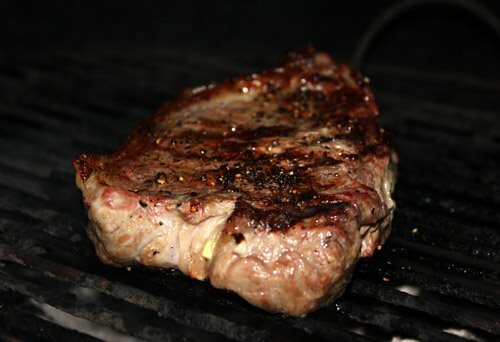 Grill a steak, no problem, make Kurt happy, all well and good, but wait a minute, what about my hang-ups about red meat and issues with beef processing and all of that? Could I accept this offer from TBC with a clear conscience? How would this rate in the realm of food blogging ethics? I decided to turn this into a little research project, ask some questions of TBC, and report my findings here. Before I get to all of that, I’ll tell you about this grilled steak and salsa, and farther on down the page, I’ll explain what I learned about the Texas beef industry. 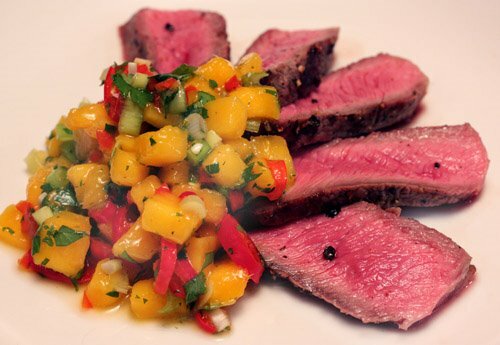 From a list of five different recipes from TBC, I chose the grilled steak with mango salsa. 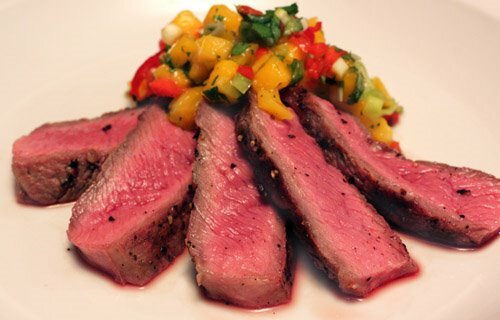 We’ve had mango salsa with grilled fish before, but pairing it with steak was a first for Kurt. The salsa came together quickly and easily. Dice a fresh mango and combine with minced green onion, fresh lime juice, chopped cilantro, and a finely chopped red chile. Just for fun, I added a finely chopped red habanero too. 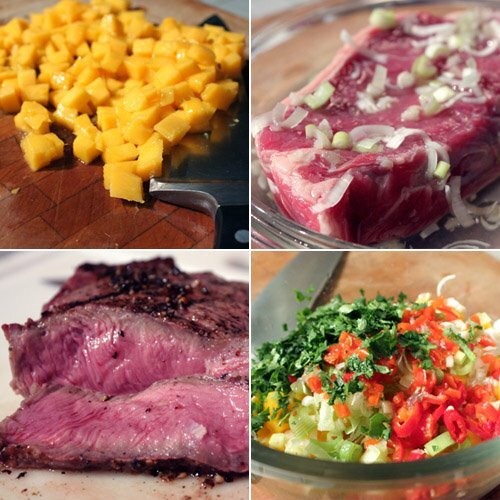 A marinade for the steak was made from lime juice, green onion, ginger, garlic, and salt. The steak bathed in that, in the refrigerator, for a few hours. When the grill was ready, the marinade bits were swiped from its surface so they wouldn’t burn, and it went over the coals. 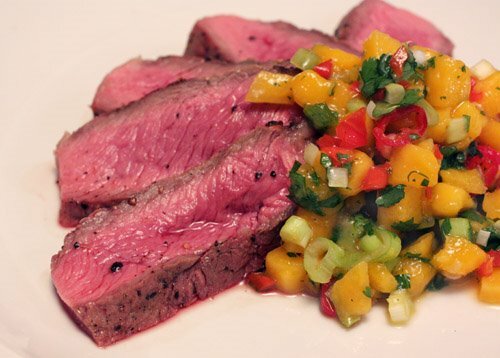 Kurt enjoyed the hint of lime in the meat from the marinade and was happy with the salsa with the steak. He usually keeps his grilled steak rather simple by just seasoning with salt and pepper before grilling, but he said this was a nice change of pace. I can report that the salsa was also very good with grilled chicken, and I’m now convinced that mango salsa would probably go well with any kind of protein. Have a look at the TBC site for many more beef recipes. First, I’ll attempt to explain my reasons for not eating red meat. I grew up eating pretty regular, American, meat and potatoes meals. However, when given options, I always chose fish and fowl over red meat. So, one April morning in 1991 when I attended an Earth Day event on the University of Illinois campus and learned about the environmental impact of cattle ranching, I made what was an easy decision to stop eating red meat. There are also a host of health-related reasons for eating lower on the food chain, but the simple fact is that I didn’t miss it much once I stopped eating it. These days, we’ve all heard the news regarding concerns about the beef industry. A frequently repeated statement is that you can do more for the environment by eating less meat than by making any other single lifestyle change. I read both Fast Food Nation and The Omnivore's Dilemma with great interest. Disturbing information about the beef industry was presented in both books. This topic has been discussed at length and current practices have been criticized by many in recent months. Rather than rehashing all of that information, my goal for this post was to ask some questions in hopes of finding news of positive change in the beef industry. I contacted the Texas Beef Council, asked a lot of questions, and learned a great deal about the beef industry. -Texas has 149,000 ranchers, cattlemen, and dairy farmers. This figure represents about 15% of the nation’s combined nearly one million beef and dairy producers. -The Texas Department of Agriculture has recognized almost 4,200 farms and ranches in 232 counties across Texas for more than a century of continuous operation. Five ranches have been recognized for 200 years and 80 farms and ranches for 150 years of operation. -Total global greenhouse gas emissions from livestock for 2006 was 18%, but the EPA put the percentage from livestock in the US at 6%. -The TBC was established in 1986 by beef producers who wanted this council to operate as an advertising and marketing arm of the industry. The TBC is funded by receiving one dollar from each head of cattle raised in Texas. Beef producers in Texas come in all sizes. There are smaller producers who raise less than 100 head of cattle on their property, and there are others who operate multiple ranches in different locations. At some point these cattle all come together in what has become the conventional process. There are several stages in the cycle of conventional beef production. First, there are cow/calf producers who breed calves that are sold to other ranchers. The calves are sold to ranchers who have available land where cattle can graze. This is the most interesting aspect of the cycle to me because there is only so much land and so much grass where cattle can be fed. Because of that, next in the cycle, cattle may be sold to a stocker who tends the animals and feeds them until they reach the weight at which they can be sold to a feedlot. A feedlot sets the weight at which they’ll buy based on the current price of grain. Once cattle arrive at a feedlot, they are grain-fed until they reach market weight. Grain is grown in mass quantities and is a more efficient feeding solution that grass pasturing. The last transfer in the cycle is to the harvesting plant, or slaughterhouse, where the beef is processed into various cuts. Interestingly, as cattle are moved from one stage of the cycle to another, they may not spend their entire life in one state. Many of the feedlots are located closer to where the grain is grown in the Midwest. Likewise, many harvesting plants are located near the feedlots. This led me to the question of what then is Texas beef? I was told that the official designation of Texas beef as defined by the Texas Department of Agriculture is that the product must have had some value added in the state of Texas. That means that just one part of the whole process must have taken place in Texas. Therefore, not all Texas beef is completely born, raised, and processed in this state. So, there are issues with supply and demand. Because of limited space and difficulties in providing enough grass, as demand for beef has grown, the process developed to move cattle to feedlots to be finished on grain. Bringing so many animals together in one place has led to other practices such as the use of antibiotics to prevent diseases being spread among so many animals. There are a lot of concerns and questions, both about the safety of the meat and the environmental consequences regarding this practice, and I did not learn of any alternatives or future plans regarding this issue. The TBC is confident in the FDA’s approval of the use of antibiotics. This is the situation in the area of large production. There are small-scale producers who are raising cattle entirely on grass, never sending them to feedlots or harvesting plants, and having them butchered locally. The difficulty is that as long as demand remains where it is or increases, it’s just not possible to supply enough beef from these kinds of small-scale operations. I ended up feeling like I didn’t quite find the good news story I was hoping to report, but I did find that the people with whom I spoke at TBC are working hard to make Texas beef the best it can be. They genuinely believe in the programs they offer and are proud of the level of quality they see at all stages of the production process. They also feel that a lot of the criticism towards the beef industry is unfair or exaggerated. It’s not their goal to promote any particular way of raising beef but simply to promote all beef in Texas. For Kurt and me, our preference is to support local, small-scale beef producers. However, there is a limit to what they can produce. We stopped by the farmers’ market last Saturday to purchase a locally raised, grass-fed, grass-finished, locally butchered steak, and the vendor was sold out an hour and a half after the market opened. So, the steak pictured in this post was a locally raised, grass-fed New York strip steak purchased at Whole Foods. The nice man at the meat counter told us that particular steak came from a processing plant in Fort Worth which only processes naturally- and organically-raised cattle given no antibiotics. The cost was the same as the other steaks in the case. If you’re interested in supporting one kind of beef production over another, ask questions about where and how your beef was raised. Or, consider seeking out a local beef producer at your farmers’ market. I don’t have any answers for the big questions about the industry, but we’ll continue to choose local, grass-fed beef for Kurt’s occasional steak meals. When I was a student at the University of Texas, I used to love the banana espresso shakes at Quackenbush’s Cafe which was located right across the street from the side of campus where I spent my time. You could get the standard banana and espresso blended into a rich, ice cream shake, or you could add peanut butter. I soon realized what an incredible thing it was to taste espresso and banana at the same time. Our local Cafe Pacha makes a similar beverage, but they keep it on the lighter side with just banana, ice, milk, and espresso and no ice cream. 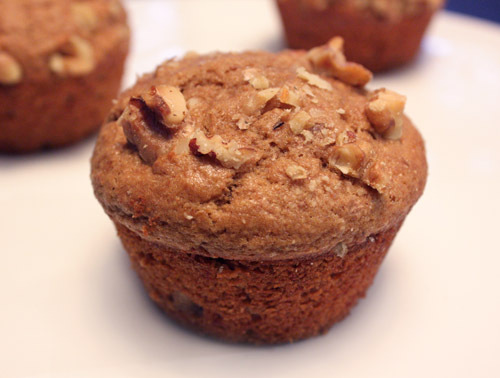 Since I already had a history with this flavor combination, I knew I was going to like these muffins as soon as I saw the recipe. This is from Super Natural Cooking by Heidi Swanson, and it’s simple enough that I could bake these regularly and enjoy a continuous supply. The obvious first ingredient here is overripe bananas. For some reason, we never have extra bananas in our house. They’re always eaten before reaching that overripe-I should bake something with these state. In fact, when I want to bake anything involving bananas, I have to plan ahead, remember to buy extra, and allow them ripen. So, I’m not even sure how it came to pass, but last week I was in the unusual situation of actually having extra, quickly ripening bananas. It was kind of exciting to get to make a banana recipe on the spur of the moment. Since I was in the spirit of using up those mushy bananas and baking something unplanned, I had to substitute a couple of other ingredients to avoid a trip to the grocery store. The recipe calls for white, whole-wheat flour which I didn’t have. I used half unbleached, white flour and half whole wheat flour. It also calls for a cup and a quarter of chopped walnuts. I only had about half a cup, so I added some almonds and pecans as well. Everything else, including the plain yogurt and espresso powder, I had on hand. As I mixed everything together and scooped the batter into the muffin tin, the aroma of espresso mingling with banana hinted at how delicious these were going to be. Fresh out of the oven, I could barely wait to have a taste. 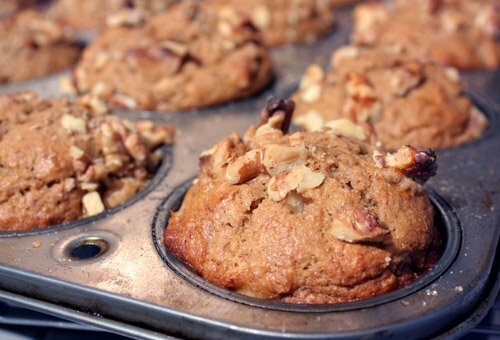 And, one of these muffins with a steaming cup of cappuccino was perfection. Now that I’ve tried these once, I may be buying extra bananas every week in hopes of finding overripe ones that need to be used a few days later. Memorial Day meals must involve grilling, and those meals have to include slaw, right? 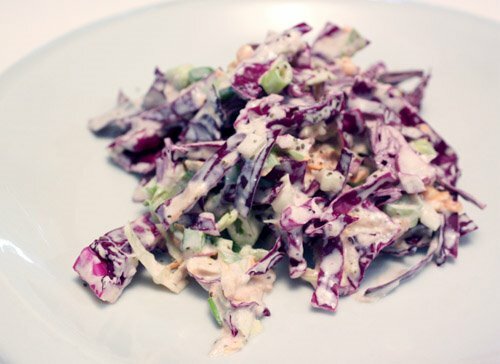 I decided that must be true, so I set out to find a new and different twist on standard coleslaw. I flipped through a couple of other books before I thought to have a look at Eat This Book by Tyler Florence. I should pick up this book more often because I’ve only cooked from it a few times, but it’s full of great ideas. The food is influenced by all corners of the globe, and as you flip pages, each recipe offers a completely different style and set of flavors from the last. I’ve made the falafel with tahini sauce which was great, and now I’m wondering why I haven’t made the sauteed feta cheese or African-spiced chicken with green olive sauce yet. I got this book back in 2005 at our local wine and food festival. Tyler was at the festival, did a cooking demo, and signed books. In my book, he wrote: “Lisa, cook your heart out.” Well, Tyler, I’m trying. I’m still having as much fun cooking as I was four years ago, and I now realize I haven’t been using your book as much as I should. The spicy slaw accompanies pulled pork barbecue in the book, but we paired it with grilled chicken sausages. 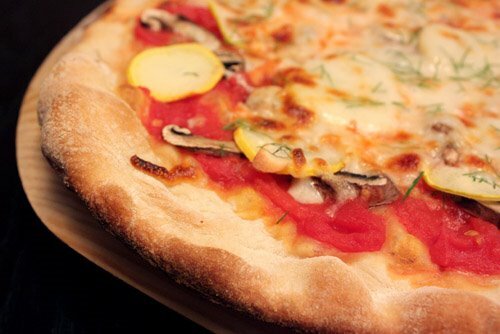 I was thrilled to have almost all the ingredients for this from our CSA. Red cabbage, a baby head of green cabbage, onion, and carrots all came from Hands of the Earth Farm. 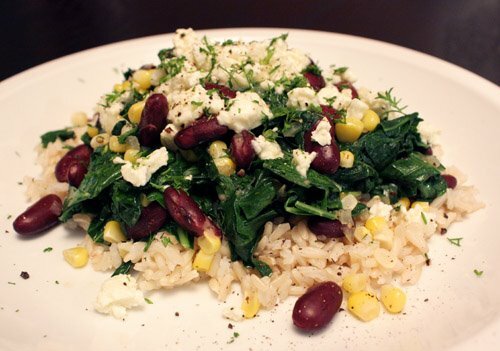 Green cabbage was suggested in the recipe, and red chiles were to be used for color contrast. Since I had that lovely head of red cabbage and the smaller green cabbage, I used them both and then used both a red chile and a green one. The carrots and onion were shredded on a box grater, and the cabbage was thinly sliced by hand. Green onions, a red chile, and a jalapeno joined those vegetables, and the combination was mixed with a dressing of mayonnaise, dijon mustard, cider vinegar, lemon juice, celery seed, and hot sauce. A pinch of sugar and salt and pepper were added. 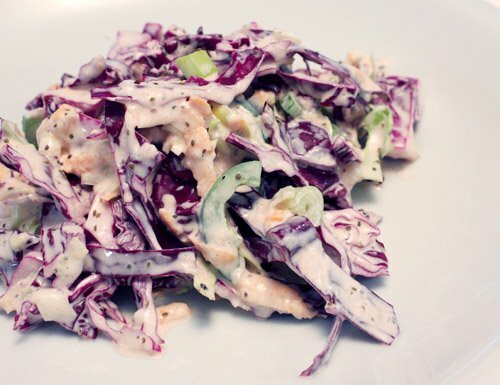 I really like celery seed in slaw, so I garnished with a little more of it on top. This wasn’t a thick, gloupy kind of slaw since the vinegar and lemon juice thinned the mayonnaise a bit, but the dressing was still nicely creamy. The crunchy cabbage and sweet carrots with the spicy chiles and zing of the hot sauce in the dressing made for a lively and delicious slaw. It was a great side dish for our sausages, and it would partner well with just about anything off the grill. The other night, I really needed to think of something quick and simple to prepare for dinner. Luckily for me, I remembered The Fast 50 from the February/March issue of Donna Hay Magazine. That was 50 grilling recipes in a row that were simple, straightforward, and as usual for Donna Hay, looked amazing. The salsa verde salmon skewers were perfect for a main course, and I decided to add some vegetables to make each one a complete meal on a stick. The only thinking ahead that’s really required here is to get a thick cut of salmon so that it can be chopped into cubes that will work well on a skewer. I added chunks of zucchini and parboiled, small yukon gold potatoes. 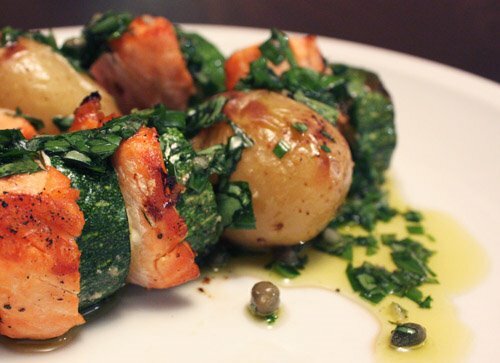 The salmon and zucchini required the same amount of grilling time, and since the potatoes got a head start on the stove, everything achieved doneness at the same time. 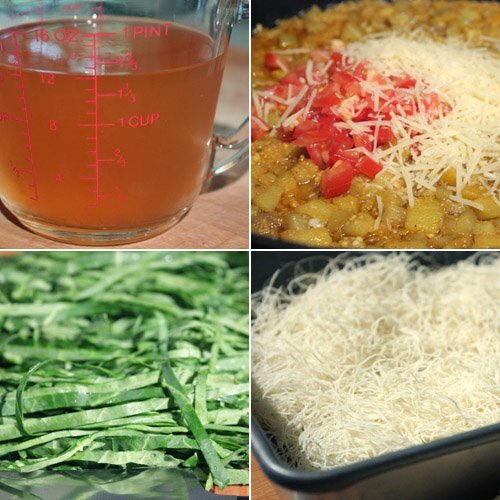 For the salsa verde, the recommended ingredients were a cup of mint, one third cup of flat-leaf parsley and one third cup of chives, a tablespoon of rinsed capers, a minced clove of garlic, and two tablespoons of olive oil. That sounded like a lot of mint to me, and since my basil plants have been growing so well, I decided to use a little mint and mostly basil. 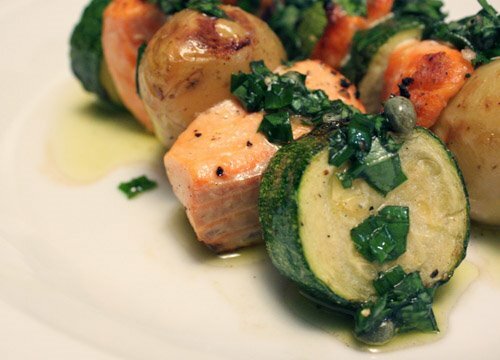 The herbs were chopped and combined with the other ingredients, and the finished salsa was drizzled over the grilled salmon, zucchini, and potatoes. It was a quick, fresh, flavorful meal lifted by the combination of herbs and the briny note of the capers. Such a simple sauce, but it brightened up and accented the grilled-in flavor nicely. This was another meal from Donna Hay that did not disappoint. And, there are 49 other quick, simple, grilled meals in that one article. 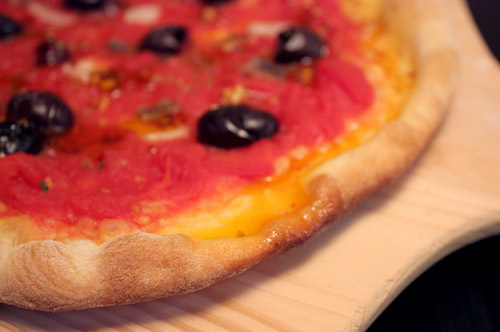 "Atlantic City has two really great Italian-American restaurants, but I haven't tried them. My Italian sister in law makes the BEST homemade manicotti... too bad my brother divorced her! Here in New Jersey, we say MAN-EE-GAUT. It's slang native to NJ." I know I can't pull off a New Jersey accent, I still haven’t even acquired a Texas accent, but I had high hopes for making manicotti. 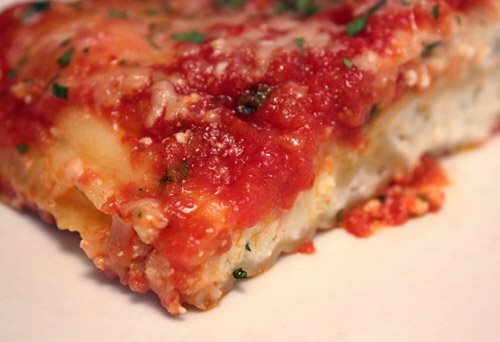 I took a look at Angelo’s menu on their web site, and the cheese manicotti is served with your choice of meatball or sausage. In the magazine, it was shown as is with no meat which was fine with me. First off, I made the sauce which was lighter than I expected. Minced garlic, a bay leaf, and finely chopped onions were sauteed in a large saucepan. Whole, canned tomatoes were coarsely chopped in a food processor and then added to the saucepan. Dried oregano joined the mix, and I used fresh thyme because I didn’t have any dried. This was cooked over medium heat for 20 minutes until slightly thickened, and then fresh parsley was added. To prepare the manicotti, you could boil them for about half the recommended cooking time, but I chose to follow a Barefoot Contessa tip. For making lasagna or stuffed shells, I do as Ina taught me and soak the pasta in a bowl filled with hot tap water for 15 to 20 minutes. 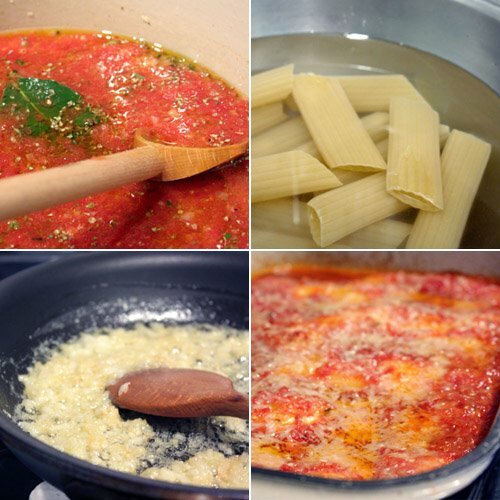 The pasta becomes pliable enough to fill and is prevented from being overcooked in the end. 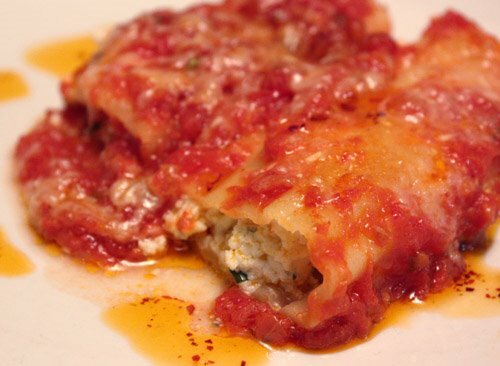 The manicotti filling was started by cooking eight cloves of minced garlic, yes eight, in butter. That’s a good start. The garlic was added to ricotta, grated parmesan, chopped parsley, freshly grated nutmeg, and eggs. This was combined and spooned into the manicotti tubes. Next time I make this, I may actually put the filling in a piping bag and squeeze it into the manicotti because the spooning method was messy to say the least. I always think transferring something into a bag is going to take forever so I avoid it, but this time it was probably the way to go. Eventually, all the filling was messily spooned into the pasta, and it was ready to be baked. A little sauce went into a baking dish, the filled manicotti were set on that, the remaining sauce was poured on top, it was sprinkled with more parmesan, and it baked for 20 minutes. Bubbly goodness emerged from the oven. Since the sauce was just chopped tomatoes with no tomato paste to thicken it, it was light and fresh-tasting. The cheese filling was as good as any cheese filling could be. I will be cooking garlic in butter and adding it to all future cheese fillings for pasta. Delicious. Just for fun, I drizzled a little chile oil leftover from the pizza I made on some of the manicotti. I couldn’t resist using the chile oil and of course appreciated the elevated spice level. Food fads come and go but classic Italian-American food is always well-loved, and now I have one more filled pasta recipe in my collection. Yesterday, I mentioned the potluck picnic I attended over the weekend, and this is the tart I brought along with the sugar cookies. For this food blogger event, I wanted to stick to recipes that I had made enough times to be sure of them. This tart isn’t quite as tried and true as the cookies, but it’s been in my binder full of keepers for several years. This comes from the very early days of the Foodnetwork. 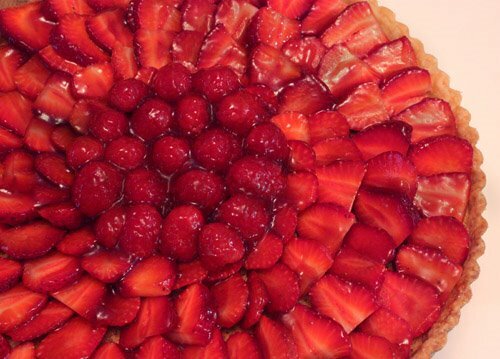 I believe this was from Cooking Live with Sara Moulton, and it was presented as just a strawberry frangipane tart. I added the raspberries, and really any combination of summer fruits would be delicious. This is an ideal tart for a picnic because there is no pastry cream filling and no need to refrigerate it. A pate brisee was made first and fitted into a tart pan. The pastry was topped with the frangipane which is made from softened butter, sugar, an egg, finely ground blanched almonds, almond extract, almond-flavored liqueur, and flour. The tart shell with frangipane was then baked for about 40 minutes. After it cooled, it was topped with sliced strawberries and raspberries. 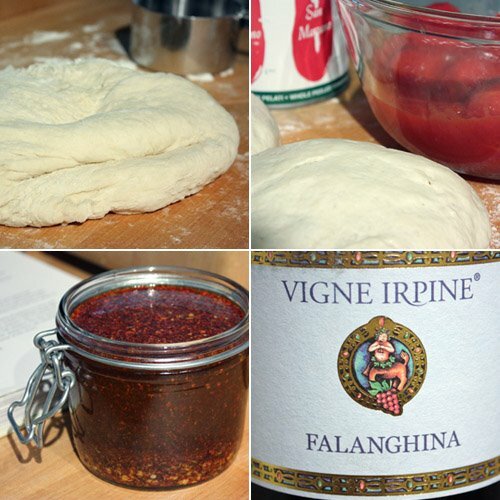 And, the last step was to brush on melted and strained strawberry jam. In the past, I’ve always served this with whipped cream, but I thought the cream wouldn’t hold up well at a picnic and left it behind this time. The frangipane seems to become part of the bottom crust but offers its hint of almond flavor. The fruit is the real star, though, so it has to be ripe and juicy. I used some organic strawberries that had nice, red color throughout when sliced, and the organic raspberries didn’t need any help in looking like little jewels. 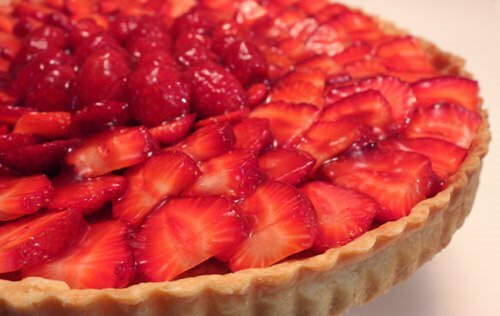 I love the sheen of a jam topped tart, and the strawberry jam here added a nice reddish glow. This is a great dessert to make several hours in advance as it holds up well. Also on the dessert table at the picnic was a delicious lemon tart made by Anna of Cookie Madness. There was so much good food that day. I’m still thinking about all of it. These are not just any sugar cookies. No, sir, these are the sugar cookies. These have been my sugar cookies since my Mom first showed me how dough is rolled and cookies are cut. I have to tell you all about them as soon as I explain the reason I baked them this time. Yesterday, there was a potluck picnic for Austin food bloggers, and this was the first such potluck I had attended. When faced with deciding what to bring to a picnic for a group of food bloggers, I wanted to be sure it was something tried and true. Ethel’s sugar cookies fit that description more so than anything else I’ve ever made. 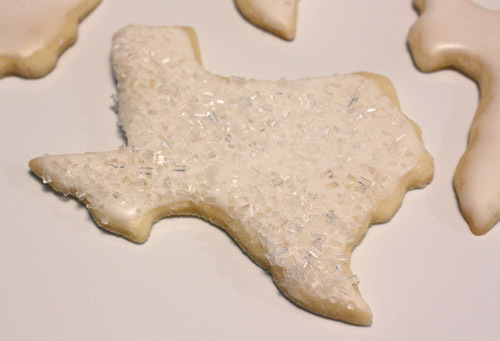 And, since these were for Austin food bloggers, it gave me a great excuse to use my Texas-shaped cutter. The picnic was hosted by David Ansel of The Soup Peddler, and the food was incredible. We’re still talking about that smoked, stuffed chicken, and we’re sure it was the best chicken we’ve ever had. And, those pea shoot and strawberry sandwiches were a fresh and delicious flavor combination. Kurt loved the fried pork ribs, and I couldn’t stop eating the spicy potato salad. Then, there was dessert. We filled dessert plates three times and were still looking longingly at things we hadn’t tried. Next time, we’ll need to prepare for a day like this. Maybe a few days of fasting prior to future potlucks will help. Note: I always double this recipe and make a lot of cookies at once. A doubled recipe yielded about five dozen three and a half inch wide Texas cookies. 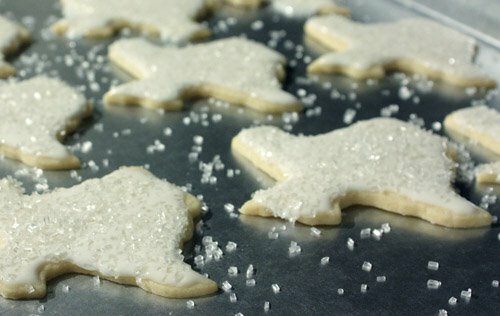 I was asked about the royal icing used on the cookies, and I always follow a recipe found in The Martha Stewart Cookbook . 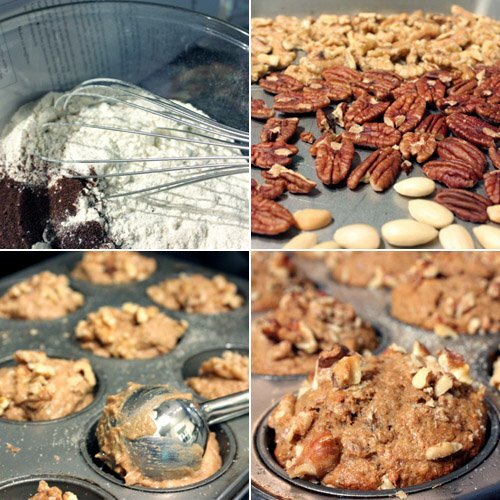 -mix all ingredients in a small bowl until smooth and creamy. add more sugar if the consistency is not thick enough to hold its shape on a cookie. When I read Sunday Suppers at Lucques , there was a handful or so of recipes that I wanted to experiment with as soon as possible, and this was one of them. This tart is the second item I’ve tried from the book so far, and the greens we’re getting from our CSA were the inspiration for it. Now, Kurt is perfectly happy with a vegetarian meal here and there, but the deluge of greens we sometimes have can make him want to be a strict carnivore. At some point, he begs for a greens-free meal, and that means I have to get creative with how they’re incorporated into dishes. This tart worked perfectly and happily was not an eat-your-vegetables experience. Instead, this was an oh this is good, and oh by the way, those are greens aren’t they kind of meal. In other words, this tart combines great flavors that work really well together. 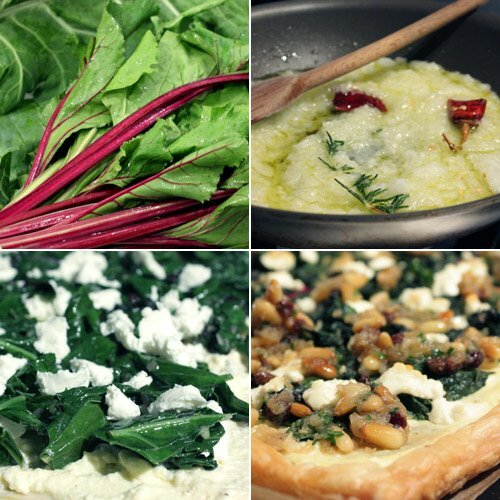 In the book, it’s described as a swiss chard tart, but I had beet and collard greens to use. Those were cleaned and chopped and sauteed in olive oil with shallot and thyme. I’ve used Whole Foods’ all butter puff pastry with good results a few times now, and that’s what I used here. The puff pastry was thawed and then just unfolded onto a baking sheet. No rolling was required. That was topped with a mixture of ricotta, egg yolk, olive oil, creme fraiche, and salt and pepper. Goat cheese was crumbled on top of that. Then, the cooked and cooled greens were squeezed to remove liquid and then spread on top of the cheese mixture and were topped with more crumbled goat cheese. It was baked for 25 minutes while the relish was assembled. 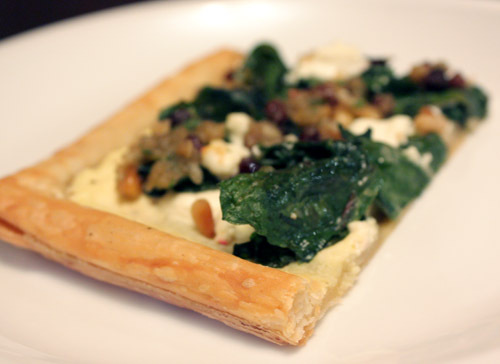 The pastry with cheese and greens was a great start, but what really made this dish was the currant pine nut relish. Pine nuts were toasted and set aside. Olive oil was heated in a saute pan and a rosemary sprig and a dried chile de arbol were added. Minced onion went into the pan, stewed for 10 minutes, and then was transferred to a small bowl. The saute pan was then used to reduce a quarter cup of balsamic vinegar down to one tablespoon. Meanwhile, currants were plumped in hot water and then drained. The bowl of sauteed onions was mixed with the toasted pine nuts, plumped currants, and reduced balsamic, and chopped parsley was added. 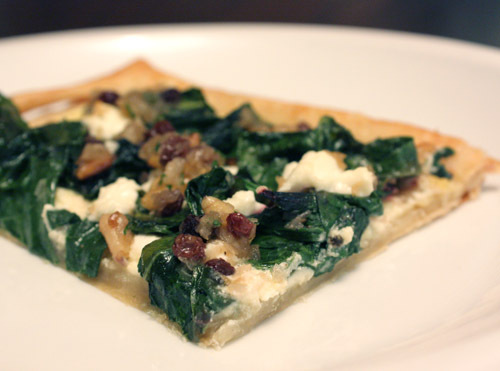 The richness of the ricotta and creme fraiche was fanastic with the greens. And, this could, of course, be made with milder spinach, but let me tell you about the relish first. The currant pine nut relish with the sauteed onions and reduced balsamic vinegar was such a perfect complement to the greens, I would recommend using the boldest flavored greens you can find. The layers of sweetness and spice and the hint of acidity mingled with the bitterness of the greens in amazing ways. 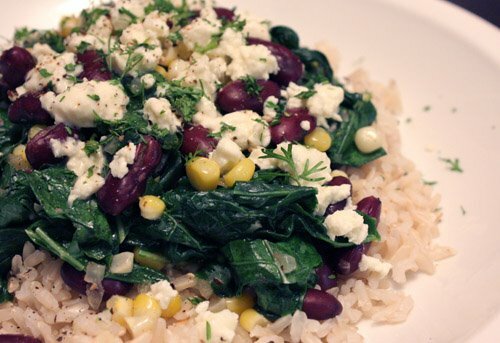 Instead of making this to use up some greens, in the future, I’ll be making this because it’s really delicious. Luckily I’ve never been asked what my top 10 favorite cookbooks are because I don’t think I could narrow it down to only 10. However, earlier today, I decided that Happy in the Kitchen by Michel Richard would have to be in that list. This book is full of food that is as quirky and fun in presentation as it is delicious. I mentioned a little more about the book the first time I cooked from it. This time, I was drawn in by the photo of this dish, and since halibut season will be over before you know it, I wanted to take a stab at this now. Halibut fillets are nestled into a messy coating of katafi and thinly shredded collard greens and then fried until crisp. Katafi is shredded phyllo dough, and I found some at Phoenicia which is a Middle Eastern deli and bakery. The collard greens were in my CSA pick-up last week. The couscous preparation was actually more involved than the fish. Richard recommends tomato water for cooking the couscous. Tomato water is made by pulsing five pounds of tomatoes in a blender and then letting the liquid drain into a bowl through a strainer while sitting overnight. Fresh tomatoes aren’t quite there yet for perfect flavor, so I used canned tomatoes. To begin the couscous, diced, peeled eggplant was cooked in olive oil in a large saute pan with turmeric. Minced garlic was added and then so was cumin and cayenne. Once the eggplant was softened, the tomato water was added, and the mixture was brought to a boil. The couscous was stirred into the eggplant, the heat was turned off, it was covered, and it sat for 10 minutes. When ready, fresh diced tomatoes were added along with Tabasco, shredded parmiggiano, and salt. This was such a well-flavored dish from the spices, Tabasco, and cheese, I’m not sure the tomato water was critical. It was fantastic as prepared, but plain water would probably have worked fine. Now for the fun part. The halibut was seasoned, dusted with flour with Madras curry powder in it, dunked into a beaten egg, and coated with the mixed together shredded collards and katafi. Each fillet was lowered into 350 degree F vegetable oil to cook for 30 seconds. Based on the photo in the book, I realized that a good depth of oil would be necessary for the frizzy coating to float upwards from the fish inside it. So, I used a two and a half quart saucepan with straight sides. It’s necessary to fry one fillet at a time, so a smaller pan uses less oil and fits one piece fine. Using a metal, slotted spoon, a fillet was lowered into the oil and held down below the surface with the handle of a wooden spoon. This was a little scary because the oil bubbled up and spattered a lot due to the water content in the fish and greens. I was sure I was going to burn the house down, but I was also sure it was worth it. It was fine. There was no grease fire, and the oil calmed down before the 30 seconds had elapsed. After frying, each fillet was drained on paper towels and then placed in a 300 degree F oven for 10 minutes. Only 30 seconds in the oil and only 10 minutes in a warm oven made me a nervous nelly for a second time. I worried for nothing because the timing was exactly right. 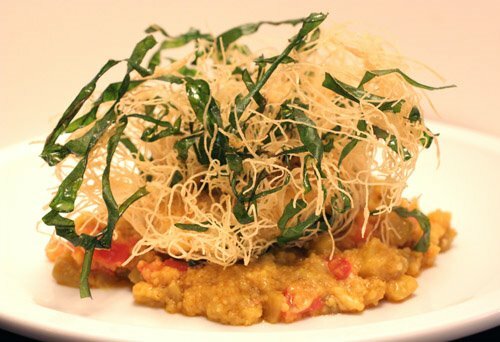 I think that struck me as much as the flavors and textures of this dish. The fish was cooked just positively perfectly. It was cooked through but just cooked through. The coating broke nicely as we cut into it, and the crunch surrounding the tender fish was pure delight. The greens offered just a hint of earthiness and shattered when bitten. The spicy flavors in the couscous were a nice little accompanying jolt. 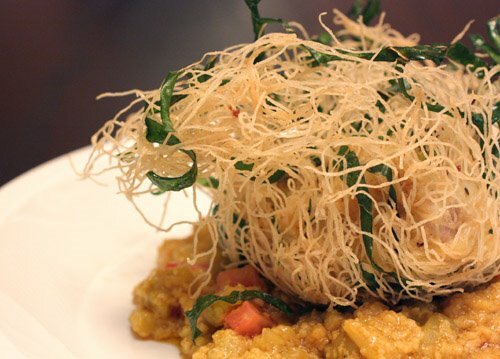 These fried nests were so fun, I started thinking of other things to hide inside them or set on top of them. And, that’s the great thing about Richard. He gets you thinking about fun things to do with food, and I look forward to trying more of his ideas.